Oh, what a magic night. 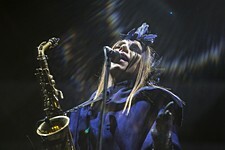 I have never seen PJ Harvey perform live before, but her concert in Oslo last week was simply stunning. This was the big drama. A concert focusing on her songs, not aiming to please possible new fans at a big, open-air festival. The main stage at Oslo's ØYAfestivalen was packed almost 20 minutes before the show was to start and when PJ and her players took the stage as a funeral marching band, before finding their right place on stage, I knew this would be a superb gig. Two marching band/orchestra bass drums, saxophones, guitars. All dressed in dark suits, except Harvey herself, who wore a blue costume, long boots, and a feathered headwear. Wow. Her nine players counted long-time collaborator John Parish (on guitars, percussion, keyboards), Mick Harvey (guitars, keyboards, percussion), Jean-Marc Butty (percussion), James Johnston (keyboards, violin, guitar, organ), Terry Edwards (percussion, baritone saxophones, keyboards, guitar, flute & bass harmonica), Alain Johannes (guitar, saxophone, keyboards, percussion), Kenrick Rowe (percussion), Alessandro Stefana (guitars) and Enrico Gabrielli (bass clarinet, percussion). And all of them on backing vocals and handclaps, as well! What an amazing band it was. And what a show! It was a dark mass (not black, though). The set was of course based around the latest album project, The Hope Six Demolition Project, which probably works even better when performed live. The big band threw themselves into "Chain of Keys". Most, well, all of the songs presented were stunning performances. "The Ministry of Defence". "The Community of Hope". "The Orange Monkey". The awesome and massive "The Wheel" kept rolling. The show fascinated, even surprised the audience. This was quite an unusual headlining act for a festival, which is mostly about partying, meeting friends and having a good time in the park. PJ Harvey's Hope Six... is about political and social engagement, concerned about what is going on in the world with too much wrongs, too little rights. Harvey has been visiting Afghanistan, Kosovo, and several 'high-rises' hoods both in England and in the US, and she's pointing her finger at ruling governments and the UN's responsibilities. Or rather lack of responsibilities and measures. Anyhow, the show presented also the full colourful spectre of Harvey's song writing, the band's eminent performance, and the splendid arrangements of the songs. Harvey and Parish have been collaborating for years, almost ever since Harvey joined Parish' [and former PJ Harvey collaborator Rob Ellis'] band Automatic Dlamini in 1988. 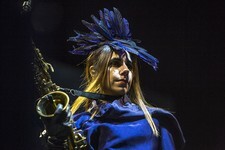 At the time, PJ Harvey played (among other instruments) saxophone, and on this tour Harvey does play a lot of saxophone. It seems she's switched from guitar to saxophone as her 'main' instrument. That said, her main 'instrument' is primarily her voice and she proves that her vocal skills are truly heavenly. Several times this night her vocals are breathtakingly beautiful. As they can be with, say, Kate Bush or Björk. PJ and her nine-man band also swerve into PJ's back catalogue as they performed "When Under Ether" from White Chalk (2007), and of course the title track from the acclaimed album Let England Shake (2011), So, after an hour or so, all of a sudden the band dive into the real old stuff when they serve a smashing version of "50ft Queenie" from the angry second album, Rid of Me (1993), from the time when PJ Harvey were a trio. This leads up to the closing part of the show, with a raw take on "Down by the Water" from To Bring You My Love (1995), which was PJ Harvey's first collaboration with John Parish [well, at least since Harvey was in Parish' band], as well as it was her first encounter with Mick Harvey and Jean-Marc Butty. Then we got an absolutely stunning version of "To Bring You My Love" (after a small break when a guitar string snapped under the guitar intro - in fact this was the only flaw of the night, but it just gave a human touch to the band and their performance: an 'analogue error' of the familiar kind). The band returned to Hope Six... when closing the show with the magic of "River Anacostia". Like under several songs this night you can just imagine the atmosphere when the backing vocals of the nine men supported, almost merged with the voice of PJ - like a massive choir. Towards the end of the song, the band lined up and left the stage the reversed way of how they entered: as a funeral, marching band as the song ended and everything faded. The end. Leaving us in the audience stunned, all showered in the lights from the stage. Like I said, it was an amazing concert. I only visited the first two days of this year's ØYAfestivalen, but PJ Harvey overshadowed everything else I saw. Period. Well, almost everything, as I on Wednesday saw the cool show by the astonishing Norwegian instrumental duo Aiming for Enrike when they took the third stage early in the afternoon. Aiming for Enrike (Simen and Tobias) did a great show, presenting songs from their latest album, Segway Nation plus a couple of new ones. They made the rain stop, and they somehow managed to make the sun come shining! The week before ØYA they performed with Jaga Jazzist at Le Poisson Rouge, New York City. Check this band out, right now! I have seen them before, and I will see them again. Later in the evening I went to see Ane Brun's gig at ØYA's 2nd biggest stage. Brun and her eminent players (Martin Hederos, Ellekari Larsson, Ola Hultgren, Dan Berglund, Johan Lindström, Micke Häggström, and Josefin Runsteen) did a great show, mainly based around her latest album When I'm Free (which isn't my personal favourite). Well, as great it can be inside the strict festival format regarding time and place/surroundings. Ane Brun is highly professional, and she's got the voice, and she's written a lot of great pop songs - both of happy and sad, serious and joyous kind. She is a graceful dancer and performer as well. Very, very good. She even threw in a surprising cover song: Beyoncé's "Halo". Believe me; Ane Brun made it her own. So, let all the talent show artists singing "Halo" go blush in shame. Well, that was it. Last thing: Polly Jean Harvey is the real Queen of England. Maybe now more than ever, as Brexit happened earlier this summer. Let England shake. Let shake ØYA. Until next year. You may also want to check out our PJ Harvey articles/reviews: Let England Shake, To Bring You My Love.